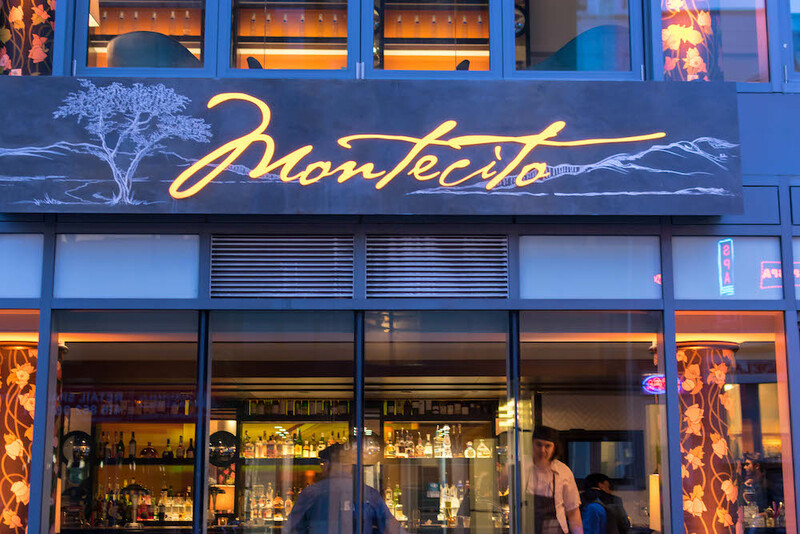 Montecito is an elegant two-story restaurant tucked away behind TIFF Bell Light Box. For those who are unfamiliar, Montecito is owned and inspired by famous Hollywood film director Ivan Reitman (Ghostbusters (1984), Animal House (1978) to name a few). Instead of a typical sit-down dinner, we were invited to engage with over 20 vendors that supply food and drink to Montecito’s menu. Montecito's interior is elegantly and thoughtfully designed with art, film stills, and even rolling video of a view from Reitman’s Montecito home integrated into one of the walls of the restaurant. I love venues that feature different types of spaces that give off different vibes. Montecito offers several different areas for food and drink with their upstairs and downstairs bar, lounge, patio, and dining rooms. There were a lot of vendors spread throughout the first floor (we visited every single one!) but for organization and clarity, we approached the evening in roughly the following manner: appetizers/snacks, mains/produce, desserts and then drinks. Pluck Teas - We had a chance to sample some refreshing cold tea combinations from Pluck Teas. Their tea ingredients come from ethical sources, local growers, and artisan producers. Chasers Juice - I love smoothies and visited this booth multiple times throughout the evening. Chasers Juice was featuring their “Juice Bombs” which are perfectly portioned frozen greens and sweetener bases ready for building your smoothie. The greens come in three options that include a combination of a variety of vegetables (spinach, kale, parsley, romaine, collard, wheat grass, beet, turmeric, blueberry). Their sweetener bases which come in three options are made without additives (ginger, turmeric + pineapple, mango or watermelon). Add one green juice bomb, one sweetener bomb, and your choice of base (water, coconut water, almond milk, yogurt) to build a quick nutrient packed smoothie! Rodney’s Oyster Bar - I’ve passed by Montecito many times during my commute and have never had the chance to check it out - however, I have always noticed that they have $1 oyster specials on Fridays between 5-9 PM. 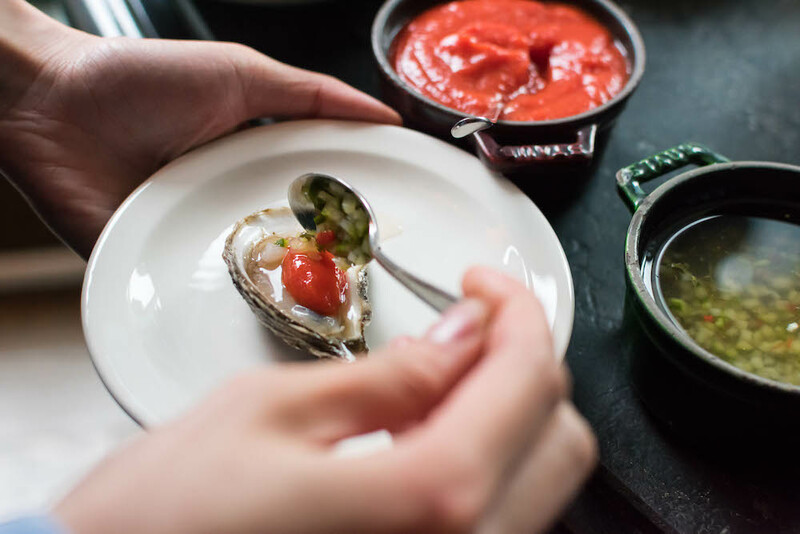 Their oysters are sourced from Rodney’s and I will definitely come back for some oysters! Trend Aquafresh Organics - Trend Aquafresh Organics had a very unique spread of pesticide-free, organic, and sustainably grown salad greens, herbs, and edible flowers for sampling. I was very surprised at some of the flavours of these greens. Some were spicy, some were lemony, some were sweet, and some had very complex combinations of flavours. I was shocked to find flavours I have never tasted before! Blackbird Bakery, 100 KM Foods, and Monforte Dairy were strategically placed beside each other so we could prepare for ourselves, a perfect charcuterie plate. We had handmade pasta from Baldarasse freshly rolled and cooked right in front of us. K2 Milling also featured their grains. Some more produce vendors for Montecito. Sovereign Farms with heirloom tomatoes and The New Farm Greens for a variety of green produce. We had a chance to sample Northern Woods Specialty Mushrooms’ deep fried chicken fried oyster mushrooms with chilli soy sauce. They grow a variety of mushrooms and had a display of a variety of live mushrooms on a real stump at Montecito’s event. We’re often so disconnected with our food that It’s easy to forget just how our food is naturally grown and where it comes from. Fogo Island Cod - Tasty tuna tartare made with Fogo Island Cod! Lennox Farms - Lennox Farms showcased some of their rhubarb and we had a chance to taste some rhubarb jam with foie gras! Harmony Organics featured a variety of ice cream flavours(Earl Grey, Roasted Marshmallow, Cookies and Cream) as well as their Chocolate Milk. You’ll know it’s a Harmony Organics product by their “whispering” cow logo which is actually an image of one cow licking another cow’s ear. We got to try Ketel One Vodka’s super refreshing mixed cocktail made with Ketel One vodka and Fever Tree Gingerbeer (non-alcoholic). Highly recommended! Reunion Island Coffee Roasters offered us a beverage made of coffee and tonic water, served cold. I was a little sceptical at first, but it turned out to be pretty refreshing! I love that Montecito’s menu is comprised of locally grown and ethically sourced food and drink. These ideals have never really been in the forefront of my mind when deciding what to eat and where to buy, but I definitely think it’s important to eat in a responsible, sustainable, and ethical way. Having a chance to talk to some of Montecito’s farmer, forager and brewmaster partners has really inspired me to think a little more about my food choices and where my food is coming from!